A Palestinian official who said the US president had claimed God told him to invade Iraq and Afghanistan says he did not take George Bush's words literally. Nabil Shaath said he and other world leaders at a Jordan summit two years ago did not believe Mr Bush thought God had given him a personal message. 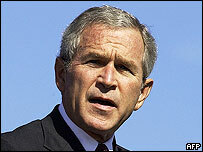 Mr Bush's spokesman said the original allegation, which will appear in a BBC documentary next week, was absurd. Scott McClellan said the comments had never been made. The comments were attributed to Mr Bush by Mr Shaath, a Palestinian negotiator, in the upcoming TV series Elusive Peace: Israel and the Arabs. "God would tell me, George, go and fight those terrorists in Afghanistan. And I did, and then God would tell me, George, go and end the tyranny in Iraq... And I did. "And now, again, I feel God's words coming to me, Go get the Palestinians their state and get the Israelis their security, and get peace in the Middle East. And by God I'm gonna do it." But in an interview for the BBC Arabic service on Friday, he said the president - who had just announced an end to hostilities in Iraq, was merely expressing his heartfelt commitment to peace in the Middle East. "President Bush said that God guided him in what he should do, and this guidance led him to go to Afghanistan to rid it of terrorism after 9/11 and led him to Iraq to fight tyranny," he said. "We understood that he was illustrating [in his comments] his strong faith and his belief that this is what God wanted."